A new review after one year. The refused to waive the annual fee fully even though my spend is prolly above 10k per year. The still charged a total of $50 for one main and one supp card. That said, I'm still going to use it because the rebates are pretty good so far for rebates. I might stop once I change to a full points/miles system. Good for dining and Super marketing spending with a high cash back of 10%. Only draw back is the cash back cap and high minimum spending of $700. Well, this card is alright. nothing much i can complain about. serve as a decent credit card for casual spending monthly. 1 thing to note is that the annual fee is $230 and the fee waiver process takes at least 2 working week before you get any notification. 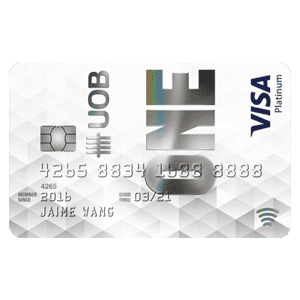 This is the cash back card i will recommend to others. ATU NETS FlashPay for up to 4 times per month earns you 5%. So every $50 top up earns you $2.5 but only pay 50 cents service fee. 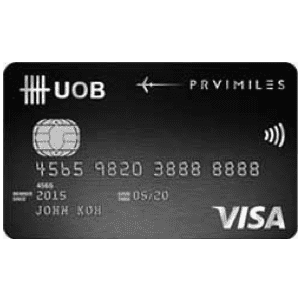 You can use this on public transportation, make payments where credit card is not accepted, only NETS (like People Park Complex). The usual Ezlink Top Up doesn't earn you anything. Besides, telco bill, hospital bill also earn 5% which is not very common to other credit card. You can also use this card to pay income tax/property tax, insurance premium, seasoned parking, condo maintenance fee etc via CardUp earns you 5% cash back. 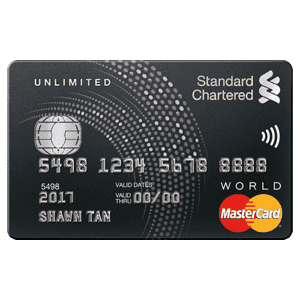 There is no other credit card that can offer the same (as far as i know lar). However, you need to pay 2.6% service fee to CardUp. This transaction will be categorised under online transaction which cap at $600 spent per month. Grocery shopping at 5% is just normal cashback you can get from most credit card. Therefore, if you consolidate these expenses into one card, it is easy to achieve $700 min spent per month. The cashback is cap at $100. 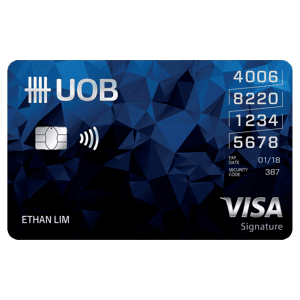 One of my fave cards I would say because the cash back is simple to achieve as long as you meet the monthly minimum spending ($500 when I first got the card months ago, now they revised to $700 per month since end Apr but it’s very doable for me cos I charge nearly everything to this card). Although they increased the minimum spending, BOC also upped some Cashback %, like dining is now 10% Cashback compared to 7%? (I think) before. Easy to use because there’s no other hoops to jump (eg. 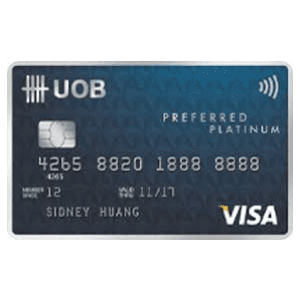 Some other cards required minimum 8 transactions of $30 at least plus $500 total per month to get cash back) BOC family card is simple. Just hit the minimum $700 and next month you will get the cash back which is directly credited to your bill and deducted from payment. Easy! 5% off on supermarkets. Everyone needs that! I would have given it a 5 star rating except that the internet banking isn’t so user friendly and some websites or retailers machines don’t accept BOC cards. I’ve faced some problems making payment in some outlets but not a major problem. The BOC call center staff are fantastic. Would recommend this card! Rating it cheekily. This is the best "dating" card. Guys will be relieved to know with the BOC card, there is a smaller hole burnt in their pockets with the 10% rebate for local dining and movie tickets. Of course, there is a cap of $30 per billing cycle (approx $30 expenses); so guys don't indulge your girlfriends too much with the BOC card :P As for families, there is a 5% rebate for grocery shopping and teleco bills. While the overall rebate cap for expenditures is $100 per month, this is acceptable given that financially prudent individuals are unlikely to spend a large expenditure. Best card out there at the moment, putting our local banks' credit cards to shame! Enjoy up to $1,200 of cash rebates a year. Cash rebate for dining, cinema and selected merchants will be capped at $25 per Card Account per billing cycle. To enjoy cash rebate, there must be a minimum spend of $800 in a billing cycle. For more info on Cash Rebate please visit the BOC Family Credit Card Cash Rebate T&Cs. 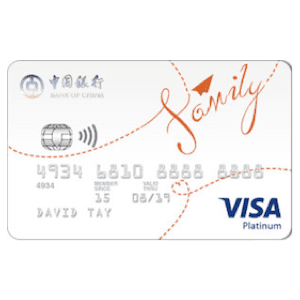 For more info, you can check out BOC Family Card’s website.